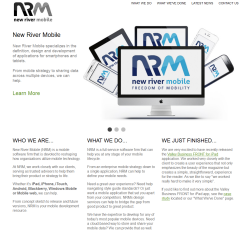 New River Mobile (NRM) is a division of ACI specializing in mobile application development. Custom development is available for iPad, iPhone, iTouch, Android, BlackBerry, Windows Mobile, or Mobile web. From concept sketch to release and future versions, NRM is your mobile development resource. Need a great user experience? Need help navigating style guide standards? Or just want a mobile application that sets you apart from your competitors. NRM’s design services can help to bridge the gap from good product to great product.